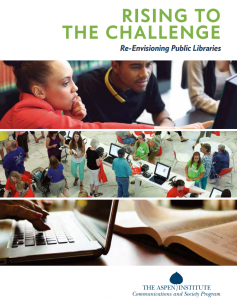 In October 2014, the Aspen Institute issued a new report on the future of libraries, “Rising to the Challenge: Re-Envisioning Public Libraries.” I received a copy of the report at a national conference for State Librarians and was delighted to discover that it is an eloquent description of today’s libraries. Throughout my visits to libraries in New Mexico, I have time and again observed how you all are arising to the many challenges that face public libraries today. As we kick-off the New Year, I would like to take this opportunity to explore the new roles today’s libraries play in their communities in New Mexico: a topic very familiar to us, but perhaps a bit of a mystery to non-library users and civic leaders. As all of you in the frontline know, libraries are more than a place to check out books: they are lifelines in their communities, connecting library visitors to jobs, health care, citizenship services, community services, homework help, cultural opportunities, and, in many cases, their local government leaders. Public libraries open their doors to patrons on chilly mornings, greet kids after school as a safe place, and keep the Wi-Fi running 24/7. Some, thinking of the traditional lending library model, might question the relevancy of libraries. But in this era of information – in which it flows fast and free all around us – public libraries are anchor points to real, useful information, and the skills to access this information. In the first few weeks of the New Year, each public library will be receiving a copy of “Rising to the Challenge” from the State Library. I encourage you to review this report and examine what your library is doing outside of that traditional model; how to advocate all the services you provide that your community may not know about; and be prepared to discuss the many roles your library plays in supporting the economic and cultural growth of your community. If you are not affiliated with one of our public libraries and would like to view the report, it is available online here. I look forward to the dialog that comes from re-envisioning the role of public libraries in New Mexico, and your ideas on how the State Library can assist public libraries to create connections, share ideas & lessons learned, and how we, at the State Library, can focus our services to support this exciting and dynamic shift in library services. Tech You Can Use: SignUpGenius!